“The Belt and Road” becomes the World Land-Bridge! 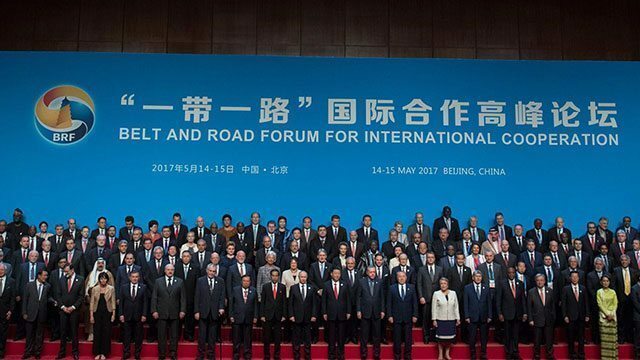 Helga Zepp-LaRouche was invited to participate in the thematic sessions on think tank exchanges on May 14 and 15, held on the sidelines of the Belt and Road Forum. On the first day, she was a discussant at the session on the Belt and Road for Facilitating Strong, Balanced, Inclusive and Sustainable Global Economy, and on the second day, she was a speaker at the 5th Global Think Tank Summit, Gathering Wisdoms for Promoting Global Growth. On Victory over Fascism Day, May 9, Neo-Nazi “National Corps” (former Azov Battalion unit) staged a new attack on Progressive Socialist Party of Ukraine (PSPU) leaders Dr. Natalia Vitrenko and Vladimir Marchenko. Helga Zepp-LaRouche’s pre-recorded presentation to a May 4, 2017 conference on “The Future of Ibero-America Lies in the New Silk Road.” Mrs. Zepp-LaRouche develops a dramatic vision of economic “win-win cooperation” capable of uplifting every human being out of poverty; and of the potential of the New Silk Road policy to unleash human creativity across the globe capable of creating a new cultural Renaissance. The keynote was broadcast to meetings gathered in Mexico City, Hermosillo and Querétaro (in Mexico); Lima and Pucallpa (in Peru); and Guatemala City, as well as being webcast live over the internet. Helga Zepp-LaRouche, founder and president of The Schiller Institute addressed at the international conference, “Think 20 (T20) Summit”, held in Beijing, China. About 500 think tank experts, politicians and representatives of international organizations from 25 countries worldwide gathered in Beijing to contribute their wisdom to the G20 Hangzhou Summit on building new global relationships. Helga Zepp-LaRouche, founder and Chairwoman of the Schiller Institute, spoke today in New Delhi at the Raisina Dialogue, co-sponsored by the Indian Ministry of External Affairs and the Observer Research Foundation. The two-day conference is described by its organizers as being “designed to explore prospects and opportunities for Asian integration as well as Asia’s integration with the larger world.” The event hosted more than 100 speakers from over 40 countries. 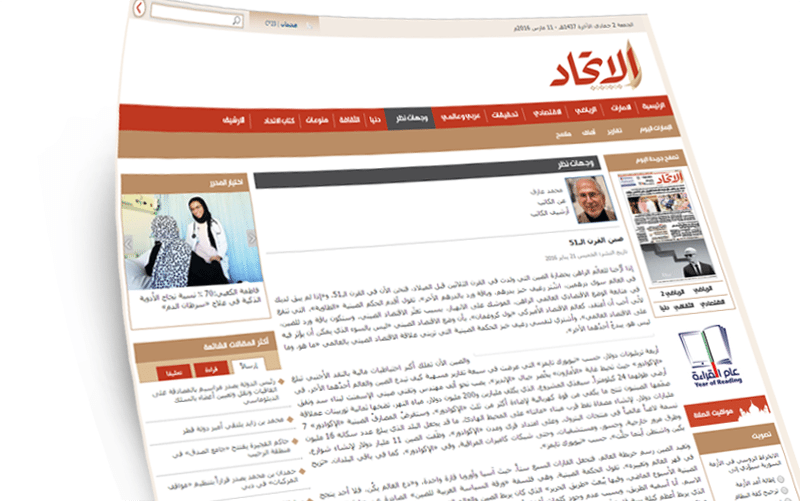 The Arabic-language newspaper Al-Ittihad in the United Arab Emirates published a column by Mohammed Aref, a science and technology consultant, on Chinese President Xi Jinping’s visit to Saudi Arabia, Egypt, and Iran, congratulating the New Silk Road Lady—Helga ZeppLaRouche—and the Schiller Institute for this new visionary policy. Schiller Institute founder and chair Helga Zepp-LaRouche addressed two Tokyo events on Dec. 2, delivering a clear message to 400 Japanese business leaders that the World Land-Bridge is the only way to end the tyranny of war and geopolitics and solve the ongoing Middle East crisis. In the morning, Ms. Zepp-LaRouche addressed the seventh annual Asia Innovation Forum, attended by 300 young Japanese entrepreneurs and hosted by Nobuyuki Idei, former Chairman and CEO of the Sony Corporation and now the founder and CEO of Quantum Leaps, as well as the founder of the Asia Innovators’ Initiative. Helga Zepp-LaRouche addressed the Canon Institute, in Tokyo, Japan. In her speech she discussed the current condition of geo-political hot spots of conflict, contrasted with the proposed world land-bridge. 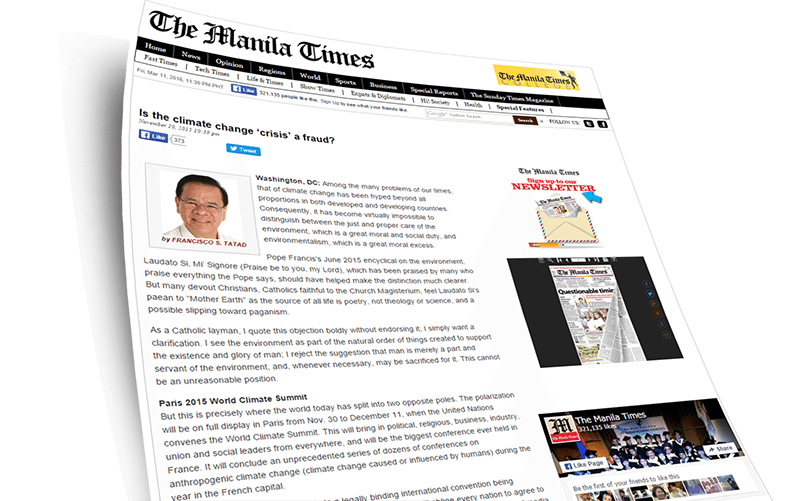 Former Philippine Senator Kit Tatad issued a scathing attack on Obama and fullsome praise of Putin and Xi Jinping in this morning’s Manila Times, the first day of the APEC Summit, quoting directly from the Press Club event featuring Helga Zepp-LaRouche and Senator Mike Gravel on Oct. 27. 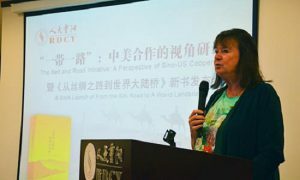 The Chinese edition of the EIRreport, “The New Silk Road Becomes the World Land-Bridge” was officially presented by Helga Zepp-LaRouche, the founder of the Schiller Institutes, at a symposium sponsored by the Chongyang Institute for Financial Studies at Renmin University on Sept. 29. The Chongyang Institute is also a co-sponsor of the Chinese-language report. 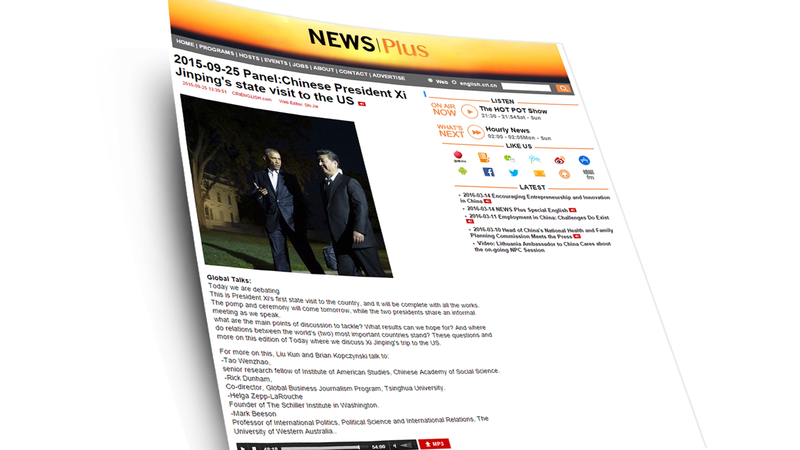 China Radio International’s program “Today” invites Helga Zepp-LaRouche, along with a variety of intellectuals, to discuss the first state visit of the Chinese President Xi Jinping to the United States. Speech by Helga Zepp-LaRouche at the city of Yiwu, Zhejiang Province, on the global strategic situation, in front of large delegations from around the world. 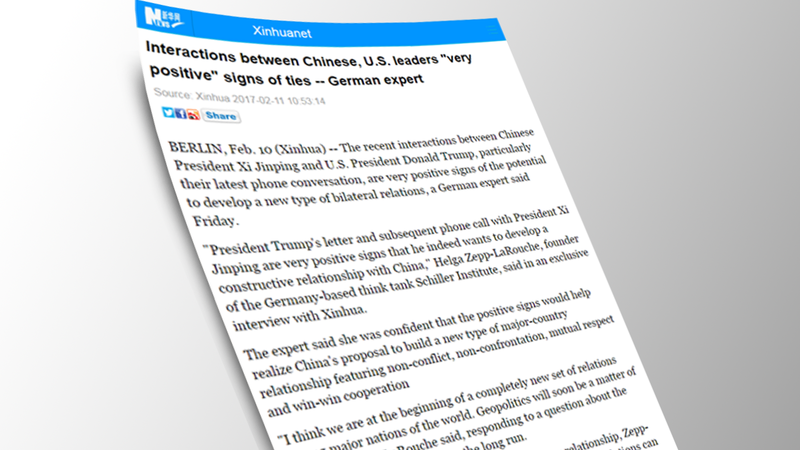 Helga Zepp-LaRouche is interviewed by the host of China Radio International’s ‘People In The Know’ program Zheng Chenguang. 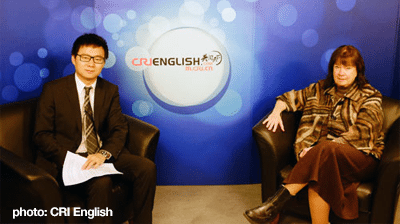 Founder and president of the international Schiller Institute, Helga Zepp-LaRouche, is interviewed by Chinese host Yang Rui on CCTV. The interview was recorded during Mrs. Zepp-LaRouche’s recent visit to China in February and aired on April 14, 2014.